As the big day nears closer, wedding signage can often come close to being an afterthought. With so many last minute details to cover, you sort of get to a point where you say "what hasn't happened just isn't happening" and you embrace it! Anyhow, there are some basic signs most couples need; here's the list and instructions how to easily and quickly acquire these beauties. Note: nothing is a *must* so don't even think about stressing yourself out if there's just not enough time or the budget has run dry! Your wedding is more about the people (the memories and the marriage) than it is about the decor, so always remember that! 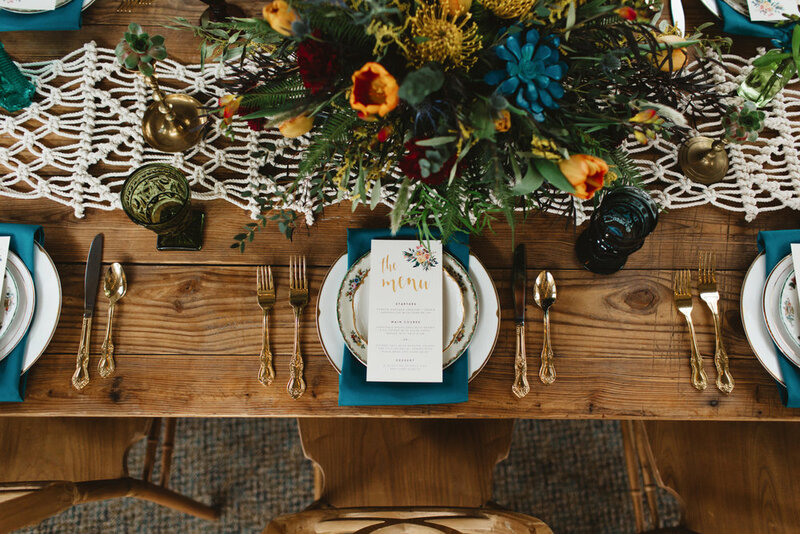 Some people aren't sure if they should sit on a certain side; whether you want to tell your guests this way -> or that way <- or want them to know to "Choose A Seat and Not A Side" I've got ya covered and know your guests will appreciate it! Whether you want to do a larger menu sign like this poster, or print individual menus for each table setting, it's a great way to let guests know what to expect so they can plan ahead for any allergies or dietary restrictions. It's also a beautiful decor item and another added detail to pull everything together! When you walk up to the bar as a guest, you are always curious what the standard is. Are there signature drinks? Is it an open bar? Is it just beer and wine? A dry wedding (lord help me!!)? You want to know what the deal is. Tell your guests in fashion! Admit it! That clever hashtag took you a hot second to come up with! 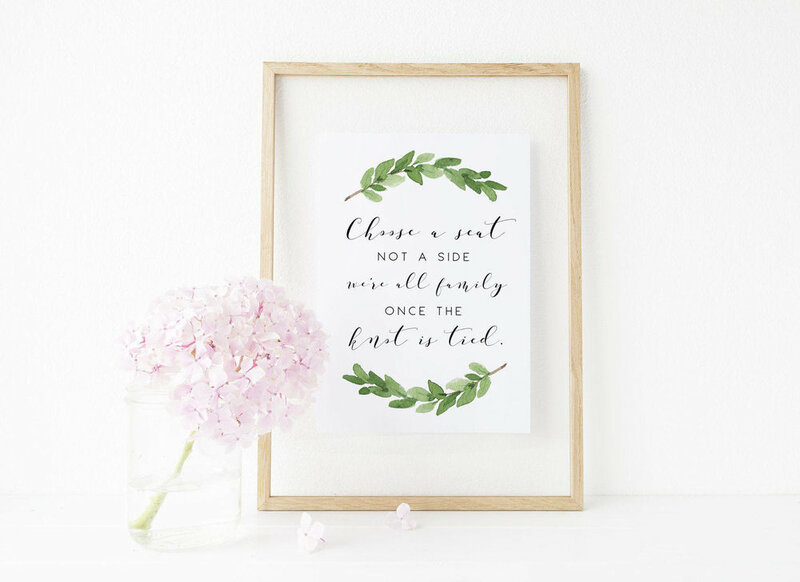 So...make sure your guests use it - this beauty serves it's purpose and you'll forever be able to look back on #allthememories! 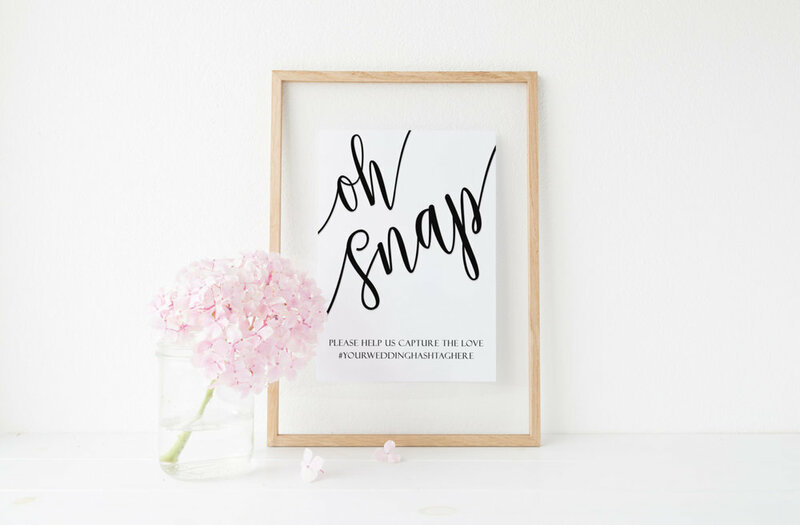 Who doesn't love a cute little favor with an adorable sign to make it so? Grab one of these (let love grow // to have and to hold) favor signs, throw it in a frame, and call it a day! This one seems so minor but is SO important! You know that feeling when you walk into a party and immediately think "where do I put my gift/card?" because you're ready to free your hands to socialize, grab a drink, and...feel less awkward ASAP after walking in that door. Cards and Gifts sign this-a-way! If you went to lengths to get a guestbook, chances are you'll want guests to actually sign it! Make it known with an easy-peasy instant download guestbook sign! Some food & drink examples of this are a donut bar, a coffee bar, a candy buffet, a hot chocolate bar, etc. and then there's always the fun activity stations whether it's a guestbook activity like "leave your favorite recipe, advice, etc." or a photo booth or selfie sign! If there's something you think of and don't see, hit the "Request Custom Order" or "Contact Shop Owner" buttons today! The "how-to" is super simple - click on any link above, or browse the wedding signs & paper part of the shop, and read through the listing description (aka "Item Details") before adding it to your cart. There you'll find any answers to your questions (size info, what info to include, turnaround time, etc.) and this way you'll know what I need from you to make it yours! When checking out, there's a little box where you can leave an optional note to the seller. Add in your info and soon enough, your inbox will be filled with the magical file all ready to be printed for your big day! Bam...done! If you have any custom needs whether for print or design, let me know! For items that are letter-sized (8.5" x 11") or smaller, you can print at home, a local or online print shop, or reach out to me to have your signs printed on hi-res archival paper that will be on your doorstep in just days, for an affordable price. Win-win! For large format items (welcome posters, seating charts, menu posters, etc.) you'll want to contact your local print shop, or use one of the trusted online printers below! 1. As a poster on an extra heavy matte paper, then frame it! 2. As a poster with foam board backing, or on a canvas. Put it on an easel (local garage sale groups and website are so amazing for this...I recently found one for $6!) and throw some beautiful florals or greenery around it! 3, As a poster, one with foam board backing, or on a canvas. Then hang it on the wall as a minimal statement piece, or add in some greenery and florals. I think that covers it, but if it doesn't you know where to find me! :) Happy wedding planning! Copyright © 2018 The Brumby Nest, LLC. All rights reserved.